Generoso Fierro – LILY & GENEROSO 4EVER! It has been two years since we last saw Ayiva (Koudous Seihon), the African refugee from Burkina Faso who settled in the Calabrian port town of Gioia Tauro and who is the protagonist of director Jonas Carpignano’s much heralded debut feature, Mediterranea. What distinguished Mediterranea was its intimacy with Ayiva’s experience as a newly arrived immigrant, and this intimacy is continued in Carpignano’s second feature, A Ciambra, but with Pio (Pio Amato), a Romani boy, now teenager, whom Ayiva sporadically encountered in Mediterranea. As a resident of Gioia Tauro himself these last six years, Carpignano has a rare and honest understanding of his surroundings and the perspectives of the people who live in it, which enable him to create film experiences that are true to his fellow residents while being reflective of his own process of assimilating into the community. Originally a peddler of small stolen goods in Mediterranea, Pio, in A Ciambra, has ambitions to follow in the footsteps of his older brother Cosimo (Damiano Amato), who subsists in the underground economy, the only economy that is accessible to the Romanis that offers any ability to ascend out of poverty. When a desperate need for Pio to contribute more to his family emerges, Pio develops a friendship and also somewhat of a partnership with Ayiva that draws into question Pio’s allegiances to his own family. 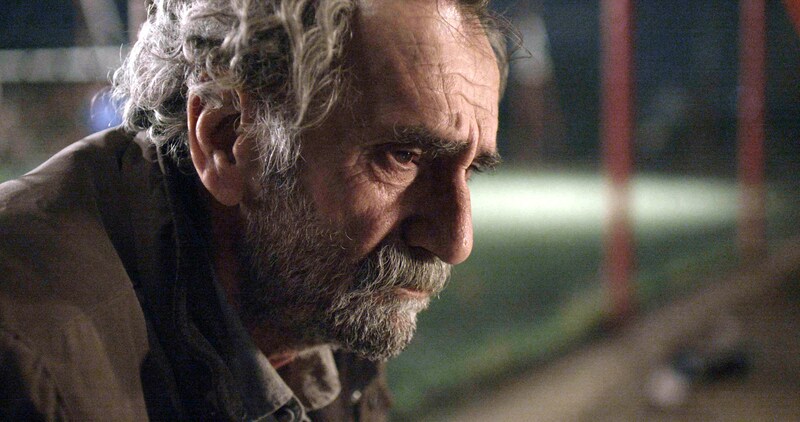 As was the case with Mediterranea, A Ciambra is fervently committed to its central figure, Pio, and as a result, the film serves as the astute second installment of a triptych of character-driven films that aim to form a comprehensive examination of the town that Ayiva, Pio, and Carpignano call home. We sat down with Jonas Carpignano during AFI Fest this past November and spoke at length about how his experiences with the people of Gioia Tauro shaped his approach to telling their stories. Q: Lily Fierro: We recently watched Ettore Scola’s Brutti, Sporchi e Cattivi, which focuses on a Romani family living outside of Rome and is also a really fine example of Italian grotesque cinema, a genre which also includes films such as Lina Wertmüller’s Love and Anarchy and Marco Ferreri’s Le Grande Bouffe. We think that a lot of people who see your film will probably connect it to either crime or neorealist genres, but, for us, we see your film, A Ciambra, as almost an update and a modernization of the Italian grotesque, mostly because it is completely unrelenting, which is a key feature of the grotesque. Even though the films that I mentioned somewhat play on comedy and yours does not, could you talk about your approach to making everything unrelenting, and in turn, perhaps updating and extending the grotesque? A: Carpignano: I think that the major distinction to make, even though I love all of those films, is that you feel that those films look to contextualize those communities and those people within Italian society, and that is why I feel that those films come off as slightly comic, or completely comic, so to say. There is certainly a way of dealing with a real situation through humor, which is common in the tradition of comedy. I think that the major difference and the reason why people tend to connect my film more to the neorealist movement is that there is an idea, or better put, a desire here to make the protagonist of the subject matter also the protagonist of the film. The goal of both Mediterranea and A Ciambra, and what was very important to me, was to show underrepresented communities, but through their actual experiences and not the way Italians experience these underrepresented communities. There is no let up. There is no moment to step back and say, “But this is the context that they live in.” This is their life from their perspective, and if it is not important to them, then it is not going to be important to us either. One of the things that people always harp on is, “Where are the Italians in these films?” and they always say to me, “Where is the port? Gioia Tauro is a major port town, so where is it?” For me, it is not important to show that because it is not important to the protagonist of the film. In Mediterranea, people always ask, “There is a mafia presence there. Why don’t you show that?” Well, if something is not important to Ayiva, who has just gotten off a boat, who is literally just looking for his next meal, and who is literally just looking for a way to bring his family over, then you will not see it. So, if the mafia is not going to be important to him, it is not going to be important to the film. It is the same thing with Pio. People always ask, “Where are the beaches in this town?” I’ll tell them, “Well, Pio never goes to the beach because Pio doesn’t swim.” So, if it is not going to be important to him, I don’t feel the need to stop and say, “This is his life, and also this is his context.” And I think that this is why my film feels so unrelenting, so to say, because they are systematically and dogmatically married to the perspectives of the people who are the protagonists of the films. Q: Generoso Fierro: We can understand your exclusion of showing the mafia in the film as you have no need to contextualize things that your protagonists do not encounter as part of their experiences. However, that is not to say that Pio’s experiences and interactions are entirely insular to his own Romani community. A Ciambra captures Pio’s interactions with many people, and from them, we get a sense of the social structure that Pio sees and must learn to navigate. In one particular scene, where Pio almost gets run over by a car, and in the car we see a mirror with cocaine, you expose the different kinds of criminality that occur between the groups that Pio encounters. With the “Italians,” the criminality is seen through protection and strong-arming. With the Africans and Romani, their crimes are mostly petty ones and auto theft, yet with none of these groups do we see drug trafficking. Is your omission of narcotics sales a statement on these two groups’ limited powers of organized crime? Or, did you simply not experience that form of crime in these communities? Q: Lily: As you mentioned in the discussion after the AFI Fest screening of A Ciambra, you are creating a triptych of Gioia Tauro. You started with Ayiva’s story in Mediterranea, and Ayiva continues his thread into A Ciambra, but did you write something that details Ayiva’s progression in between the two films? What are we to assume about Ayiva’s integration into this world in the time period between Mediterranea and A Ciambra? A: Carpignano: I didn’t write it, but it was something that sort of wrote itself just because I live with him (Koudous Seihon). I have seen the difference in his, and I don’t want to say “status,” but position in that community. Whereas in the beginning he was just someone who picked oranges, years later, he has become someone who can move in a different way around Gioia Tauro because of his charisma and because he has been living there for so long. So, I have been able to see what should happen to Ayiva through what has been happening to Koudous and to many people as they sort of try to move into the underground economy. Obviously, there is no place for them in the actual economy; no one is going to give them jobs as we’ve seen in Mediterranea, so where do you go when you are sick of picking oranges? What is that next step? And naturally, that next step is participating in a kind of commerce that is somewhat underground in background. And, where are those relationships where a commerce role can exist for Ayiva? Obviously, they are between the gypsy and African communities, and not necessarily where the other communities exist in the town. How I see what happened to Ayiva between his arrival and now, is in some way, parallel to what happened between Pio’s grandfather and his family in the years since they settled and became part of Gioia Tauro. That process of becoming sedentary, of deciding that you are going to stay and live in a specific place, changes your occupations and your possibilities within this underground economy. Q: Generoso: In regards to the underground economy, there is a particular scene in A Ciambra that suggests that, at least in Gioia Tauro, the Italians and the Romani might be growing closer by how the two groups set themselves apart from the newly arrived African immigrants. 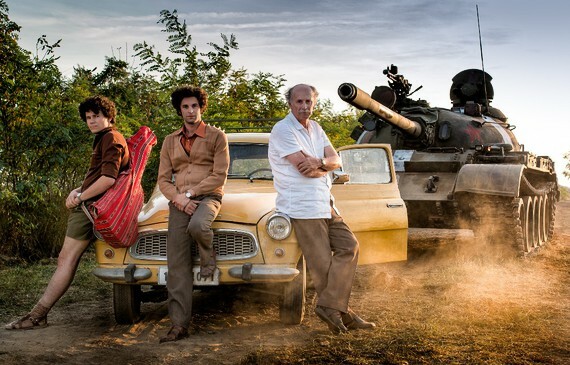 The scene we are thinking of here is when Pio’s older brother Cosimo (Damiano Amato) returns from prison and tells his younger brother about how the Romani and Italians joined forces in jail and distanced themselves from the African inmates. Q: Generoso: You in fact have a scene in Mediterranea, which is what brought up our comparison to the Ettore Scola film that we mentioned earlier, where Ayiva begins to experience the harshness of the conflict against him and his fellow African immigrants, so he responds to a rat that enters his room by stomping it to death. It seems to suggest that we have a natural inclination to step on someone in a lesser position to gain some sense of control? A: Carpignano: Wow, do you two read my emails? You just say a lot of the things that we talked about as we made the film that no one has ever written into an article. I am feeling so weird right now (laughs). Yes, that scene of Ayiva stomping on the rat is a statement that says: “This is the thing that is invading my space. This is the thing that is reminding me of where I am, so if I could kill that thing or distance myself from that thing…” This is a moment where his frustration can come out. Q: Generoso: Thinking now about that change from being nomadic to sedentary, which is an essential theme in A Ciambra, you show this shift with a motif of citrus fruits (oranges and lemons) in both Mediterranea and A Ciambra. In Mediterranea, we paid close attention to how Ayiva eats the oranges that he picks. At first, he doesn’t eat them, but by the middle of the film, we see him beginning to eat the oranges, but he does so by only peeling away a small percentage of the orange peel and eating, as if he is slowly uncovering the community where he lives. By the end of the film, he is sorting out just the peels on a conveyor belt. You then begin A Ciambra with an image of a young Emiliano, Pio’s grandfather, when he was still a traveling Romani, slicing a lemon and drinking its juice, which then cuts to the present day, with Pio handling a lemon in his kitchen. Thematically this is one of our favorite elements of your first two features. A: Carpignano: You know you two are killing me right now, because the scene that was the toughest for me to take out of the film is a scene after Pio’s brother comes back from serving time in jail, where he and Pio are sitting together the morning after their grandfather’s funeral in silence when Pio cuts a lemon and gives himself some citrus, and then he gives his brother a slice, and his brother eats it, and then the little boy comes in and grabs a piece of lemon and sits down in the chair. Q: Generoso: Oh no, why did you cut this?! We so wondered why we didn’t see the citrus used as much in the film. A: Carpignano: I am going to my editor’s wedding on Sunday, and I am going to make him pay (laughs). A: Carpignano: Yes, it is the dominant agricultural element of that region. The plain is famous for the citrus industry. People say even further back that the ‘Ndràngheta started to form because of the bergamot, that bigger yellow lemony-looking citrus thing. The bergamot was one of the first things that they exported, and they cornered the market on that, and that was the beginning of their agricultural syndicates. So, citrus is a very prominent part of the plain, and that is where they got a lot of their commercial viability. Q: Lily: Speaking of motifs, there is also a key visual motif of Emiliano and his horse that appears throughout the film. You begin A Ciambra with a scene showing Emiliano traveling with his caravan and his horse, and then, Pio sees his grandfather as a younger man with his horse as a recurring image/vision. Why does Pio see this? Is Pio one of the last of the members of the generation who is connected to the past of his grandfather, or is this past just romanticized because he has heard about it from his grandfather? A: Carpignano: It is all of the above. This is very much Pio’s story, and I think that the film tries to, through being very specific through Pio’s experience, arrive to larger truths about the Romani community in general, and one of the most important things I think about that community is this solidarity that they feel that they have. History has a weight on all of us, and this sense of tradition is what makes Pio’s decision at the end the inevitable one. I think that the greatest limit and the greatest potential of this community is its solidarity, because, on one hand, they have created this really intense social network that has kept them alive for years. There, they always say, “No one here is going to die from hunger,” and that is is because they have each other’s backs. But in another way, Pio is unable to transcend the social architecture of that place because that tight knit community won’t let anyone else in or out, and I think that part of that is because they feel that they all come from the same tradition. They still refer to the others, mind you, they are as Italian as anybody, but they still refer to the others as “Italians” and themselves as “Gypsies.” And, why is that? It is because they believe that they have a past that is different from everyone else’s, and to me, that is what the horse represents. Pio needs to feel tied to the past in some way, shape, or form. He needs to feel as part of this tradition to justify, even to himself, betraying someone who might be even closer to him than his own brother. The sense of community, the identity politics that we all fall back on, is something that I think comes from this constructed identity that exists within many communities, and most specifically this one. Q: Lily: Staying on Pio for a moment, another of his characteristics that we wondered about was his fear of closed spaces, specifically being enclosed in a space that is moving. What is the origin of that fear? A: Carpignano: First of all, just speaking about the motifs, thank you for using the word “triptych” rather than “trilogy” before, because when you look at the great triptychs, they are really tied together through overlapping characters and motifs, even less than narrative logic, so to say. When you look at one of the great triptychs of all time, the Kieślowski Three Colors films, the things that tied those films together are not only the motifs and the use of color, but also the recurring actions. But speaking about Pio, specifically his claustrophobia, to me, that is less of a dramaturgical device as opposed to a psychological one—to come up with that and to put that in a film and find the right context for it, I had to get to know him better because that is something that actually happens to him. The elevator where Pio panics is my elevator, and that apartment is my apartment, and Pio has never gotten in the elevator to get to the apartment. Every single time, we had to go up and down the stairs to shoot that scene, and we had to rebuild the elevator, putting it on the terrace so that there is a removable wall for him. Pio is actually afraid of enclosed spaces, and he is actually afraid of things that go fast, and I find that to be incredibly fascinating because we are talking about people who historically were on the road in small spaces, in caravans, and in boxcars, moving together. Now that they have become sedentary, they almost have this aversion to these things. Moving too much, moving too fast, getting in an airplane, and getting in a train are things that he just would hate to do. And, that is why the train is there as a reminder in the background. There is the possibility of movement, of mobility, but now paradoxically, the gypsies feel more true to their tradition and their people and their identity by staying put. It is as if they have gotten this piece of land finally, and they are claiming it and saying that this is ours, and now that land is the source of their identity. So, that to me was something that was very important to put in the film, because in the end, when Pio is finally forced to move, he is enclosed in this tight space in this train, and he gets flashes of everything at this one point. He begins to freak out as he is put in the position to do something that he doesn’t want to do, and that connects him to his past, his present, and ultimately, that is where he gathers the courage to do what he needs to do. I felt that putting Pio in a position where he isn’t able to reflect on what he is doing, like when he is living through this phobia, this paranoia, brings out the raw emotions in him, and that is why I felt O.K. to open it up to that dream-like space again in that scene. We were fortunate to have the opportunity to see twenty two feature films during this year AFI Fest held in Hollywood from November 9th to the 16th. Many were from veteran directors whose work we have appreciated over the years like Hong Sang-soo and Laurent Cantet, who gave us wonderful new features during the festival, but it was director Andrey Zvyagintsev, who we have admired since his 2003 film, Vozvrashchenie (The Return), who provided us with our favorite film of this year’s AFI Fest, Nelyubov (Loveless). In Loveless, Zvyagintsev follows Zhenya (Maryana Spivak) and Boris (Aleksey Rozin), a soon to be divorced couple, whose constant battling has caused severe emotional trauma to their young son Alexey, who in the midst of his parents’ other ongoing dalliances, has gone missing, a fact which is not even noticed by his parents until days later. Loveless then becomes a film that plays with its audience by putting you in the position of the argumentative couple, who seem more concerned with their anger towards one another and seemingly unfulfilling affairs than the welfare of their own child. Throughout Loveless, we see youth as a commodity in contemporary Russia in terms of romantic pursuits, yet children are often seen as an encumbrance by adults for their attainment of more financial and status oriented goals. Another dichotomy that is also depicted in the film is the divide between religion and faith and how that plays out in the decisions of key characters, which became the focal point of my discussion with Andrey Zvyagintsev, along with a comment from Zvyagintsev’s longtime collaborator, producer Alexander Rodnyansky. Q: In an early scene shot in a cafeteria that is adorned with religious paintings, we see Boris (Aleksey Rozin) speaking to a coworker about his boss, a character whom you never see, who has a requirement that all of his employees must be married. That scene drew my attention to how faith or religion is seen through certain key characters in your film. How does faith play a part in the narrative? A: Rodnyansky: It was really important for us that the comments that we are making are not about faith, but about the religion. We want to make it clear that we are speaking about the church as an institution, and let’s say the intrusion of the church into secular life as an organization, so our film does not make any comment about faith. Of course, we have a lot of true believers, perhaps not as much as we used to have one hundred years ago, but we still do have a lot. When people speak about the church, we can see it is playing a role in what the people perceive as faith. The church is a kind of an administrative department of the contemporary government. That is why we believe that this is an extraordinarily effective tool to implement the so-called conservative values in Russia today. That is why when we speak about the “religious” people, we always have a distinction between the true believers and the ones involved with the institution. Q: You show youth as a definitive commodity in contemporary Russian culture as seen through the extramarital affairs of Zhenya and Boris. I was impressed in the film by the intense level of the search that the private/non-governmental organization mounts when Alexey goes missing. Is that level of intense search more a function of the value of youth in Russian society, or more due to Boris and Zhenya’s affluent economic status? A: Zvyagintsev: Because this is a volunteer organization that has existed for seven years called Liza Alert, the people involved work regular jobs and do the searches for missing people for free. This organization looks for all missing people, so it does not have to be a child who is missing. When they receive a request, there is no money that changes hands, so the economic status of Boris and Zheyna does not play a role here. It could of course be the parents of a lost child that the organization has been asked to help, but it could also be a wife looking for her spouse, or children looking for their parents, so age does not matter, financial status does not matter. It is the awakening of citizens and their ability to organize themselves, and they do this only because of their empathy and desire to help in a way that the government cannot. Q: Have organizations like Liza Alert become more prevalent recently because of a specific crisis, like the refugee crisis in Syria or the conflict in the Ukraine? A: Zvyagintsev: No, not specifically the Ukraine or Syria, it is just a need that had to be addressed by citizens in a way that the Russian government was unable to do. Q: I ask this question as you regularly show dire, almost apocalyptic political situations in Russia via news clips seen on television during your film. This brings me back to my initial thoughts on how religion and faith are exhibited by the characters and how there may be a divide between older Russians who are gravitating towards religion because of the state of their country, and younger people who have become more secular because of the failings of the previous generation. Organized religion as you stated earlier is being used to foster conservative ideals. In general, is the current political situation driving more Russians closer or farther from organized faith, away or towards being “true believers’ as you say? A:Zvyagintsev: Statistics show that 74% of Russians say that they are believers, but when they asked that 74% if they had read the Bible or the central text of their faith, only 30% admit that they have actually read the text. It is essentially like Paganism in that there is a social sickness, and a lot of people who consider themselves “believers” don’t understand which god they serve. So, questions about growth of numbers really don’t reflect what is going on in society. It is a social sickness of Paganism rather than true belief. This sickness isn’t just unique to Russia, it is going on all over the world. There are a lot of people who look for God, but find a short God. So, the criteria for a person who is a true believer, a true Christian, like I mentioned earlier, is that he has his border between good and evil going through his heart. It is an epic battle between your real self and your fake self, and if the person sees that evil is not within him, like this religious person who considers the line between good and evil to be outside of him, then he is a fake and not a true believer. On few occasions, when witnessing a central character’s actions without dialog, can we begin to form an opinion of that particular character’s overall ethos and intentions and how that character connects to the narrative of the film. When Turn Left Turn Right begins, we see Kanitha (Kanitha Tith), a quintessentially modern looking woman, decked out in her royal blue cocktail dress. Kanitha has a raw, almost childlike intensity to her stare and stance as she wanders quietly through the ruins of Angkor Wat while Khmer era music plays in the background. As the screen fades to black, the song continues, and you are presented with a title card announcing the beginning of “Track Two” and then the image of actress Dy Saveth, the star of the international 1970 fantasy hit, The Snake Man, and one of the few stars remaining from the Golden Age of Khmer Cinema, dancing to the same song that introduced us to Kanitha, who we now see watching the video of Saveth. Kanitha is taking a break from her unglamorous job as a waitress in a rock club, where she slightly bobs her head to the music while going through the motions of work, before ending her shift and riding home to fall asleep in her work clothes on a mat next to her sleeping grandfather. End of track two. Within these early tracks, for his second feature, American-born director Douglas Seok establishes his commitment to an unconventional narrative structure analogous to that of a concept album, a method that allows movement and texture and the response to rhythm and melody to supercede dialog in allowing you unfiltered access into the mind and emotions of Kanitha, the film’s central character. It would be easy to dismiss Turn Left Turn Right as an “atmospheric exercise,” which was the fate that befell Hou Hsiao-hsien’s 2001 feature, Millennium Mambo, a film that similarly took us through the days of a woman in her twenties as she tries to suss out an existence in a place where the past eras serve as an impediment and where some archaic familial attitudes still exist. 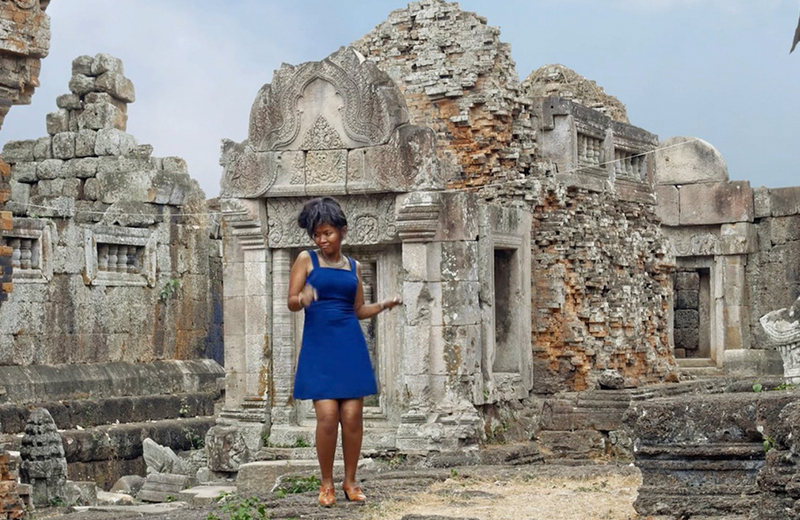 The reality of that past emerges as track three begins, when we again see Kanitha in the ruins at Angkor Wat clad in her blue dress, except now she is carelessly and joyfully dancing in a way that is completely her own to a classic Cambodian rock tune playing behind her. Here, the single camera full frame static shot with a touch of Technicolor is reminiscent of the films of the Khmer era, creating a distinct visual contrast from the moments of Kanitha’s reality, which are shot with standard, in motion HD video that is common to the language of contemporary cinema, suggesting that in her dreams, Kanitha is trapped in between the past and the present. Kanitha has two jobs: one as a waitress in the aforementioned nightclub and another as a hotel clerk, but she must still live with her grandfather and mother, who continue to badger Kanitha about her unmarried status and her lack of desire to create a family of her own. In the eyes of her family, Kanitha’s lifestyle may appear selfish, but her desire to remain outside of traditional roles appears justified when we witness the economic struggles of her friends and their lives in the marketplace. When her grandfather becomes ill, Kanitha and her mother discuss using their small amount of savings just so Kanitha’s grandfather can be treated in a hospital. Faced with such a grim financial future, Kanitha continues to work her jobs, but the dancing that once only occurred in her dreams, begins to find an unwelcome home in the reality of her day to day urban existence. It is only through her trips into the natural settings of waterways and her friend’s farm that Kanitha can finally feel unencumbered by the world around her enough to share her desire for freedom with others. In his short, but complete sixty-eight minute second feature, director Douglas Seok creates a compelling and elegant visual narrative that intertwines scenes from a rapidly changing modern life with glimpses into an era of Cambodia that has long since passed. Seok also mixes in contemporary and Khmer era vintage songs, minimal dialog, and physical expression, which altogether with the images allows his protagonist to delve deeply into a dream state without ever losing focus of the film’s essential central construct of creating a character whose choices are influenced by the conflict between her own desire to live a simpler life because of the complexity of today and the expectations and needs of the people she loves who are fundamentally connected to traditional values from a time that no longer exists. April 6, 1944 will always carry a deep meaning to the older inhabitants of the Tuscan village of Monticchiello — it was on that day in the hills near the town of three hundred inhabitants that a group of seventy anti-fascist partisans fought for hours against an organized force of several hundred fascists who were about to set upon the town. The morning after that battle, German soldiers entered Monticchiello with tanks and artillery with the mission of executing every man, woman, and child there. After pleas went unheard from many, including the town priest, one woman from the village, a Mrs. Angeheben, was able to convince the German commander to not kill everyone as she was also from the commander’s hometown of Leipzig. We will soon learn, through a few minutes of narration and flashes of archived photos in ’s new documentary, Spettacolo, that this dire moment, years later, moved the people of Monticchiello to change their annual town play from one of adapted classic theater into one that uses their own stories and personal concerns to form an “autodrama.” As soon as Malmberg and Shellen whirred by this significant point of history and its future impact, my first concern emerged: “What became of Mrs. Angeheben?” And, this marked the beginning of a stream of similar desires for clarification and expansion on the documentary’s subjects, all of whom are handled by the directors in a cursory and inept manner in Spettacolo. Like so many others, we first became aware of Jeff Malmberg’s work after seeing his deservedly award-winning 2010 documentary, Marwencol, which delves deeply into the immense power that the creation of art possesses as a tool in helping people unveil their true feelings towards real moments. Unfortunately, unlike Marwencol, which had the singular vision and dedication to the process and depiction of the artwork of Mark Hogancamp, as seen via the many model stagings he provides directly to camera, to allow the his work to convey implicitly his own personal journey, Spettacolo suffers from a lack a focus and awkward editing that consequently remove any moments of genuine emotion from the multitudes of short conversations that we see throughout this all too short (considering the scope of what is being covered), ninety minute documentary that reduces its subjects and history to a singular uninspired statement on globalization. Malmberg and Shellen focus some of their narrative on Andrea Cresti, a founder and former actor in the play who has now become its central creative director for a predominance of its fifty year tradition. Early on, the directors present a shot of Alpo, another founding member of the troupe, who is sadly in the latter stages of Alzheimer’s. He is mostly seen in old footage, and we are to assume that he is unable or unwilling to be interviewed. Then, Alpo’s longtime wife and stage partner, Elda, who is battling cancer and is not participating in this year’s play, is barely heard from as well (for possibly the same reasons as her husband, but we are never given any nuance for any explanation). Shortly thereafter, the directors cast a quick glimpse onto Arturo, another founding member and one who is quick to point out the importance of Andrea and goes as far as to state that “nobody capable of replacing him has been born yet,” which may or may not be a slight against the young woman Gianna Fiore, who patiently and tenaciously works with Andrea in what appears to be an assistant director role. But alas, we have no idea, for she is never directly interviewed, and thus we do not know how she feels about her current role and if she has any future aspirations for the play. Andrea, the person who is the closest to the main protagonist in the broken and shallow narrative of Spettacolo, rarely discusses the well-being of his company, so we are left all too often to guess the opinions and motivations of the people of Monticchiello without much evidence to help us even create those guesses. Quickly, after meeting and leaving the first set of players, we see the troupe members discussing their ideas for what this year’s play should be about, and after some un-momentous bickering, the theme of the faltering economy and its effect on the town of Monticchiello is selected. The issue with Spettacolo now becomes the fact that this is a play about modernity, but you rarely see how modernity intertwines into this world that almost seems too stuck in the past. The only glimpses into the outside world are seen through the usual method of a headline posted on the town’s newspaper box; no answers or comments on the current events in the town or outside of it are given. It is hastily mentioned that the town used to subsist from sharecropping, but that industry is gone, so are people now surviving off of some cottage industry, or are they heading into other nearby towns to work? We see Andrea’s son running his home as a bed and breakfast, and that is pretty much the only detailed glimpse into how anyone the town is surviving. We do see slick video shots of cargo-short-wearing, luggage wheeling, selfie-focused, out-of-place tourists interrupting the quaint and historic architecture of the village, but we know little about how anyone feels about these visitors or why the visitors have even chosen to visit the town. We later learn about a failed attempt by unidentified members of Monticchiello to build homes at the bottom of the mountain to encourage tourism and new tax money, but we see those homes unfinished due to some infighting, and of course, no one explains why. What are given as an answer to all of our accumulated questions of “Why?” is an endless array of travel magazine shots of the town and its rural bliss, which is perhaps Malmberg and Shellen’s way of stating that the town’s only use is that of a potential vacation village, but these shots did little more than to pound home what I feel is the intended goal of Spettacolo, which is to reduce Monticchiello’s noble fifty year theatrical tradition into another heavy handed, poorly-substantiated statement about the grim reality of globalization’s effect on history and cultural heritage. In the end, Spettacolo‘s statement of the impact of globalization is lessened by the flippant treatment given to the village’s autodrama’s history and the poorly explained economic issues of the people of Monticchiello. We, as the viewers, come away from Spettacolo without any sense of loss for this dying tradition of autodrama because we have never completely understood its past, nor are we given a full view of the drama that the townspeople hope to express to us about its limited future. During the next to last night of SEEFest (the South East European Film Festival), which took place in Los Angeles from April 27 to May 4th, I was thrilled to have a conversation that was long in the making…A decade ago, when I was co-curating the European Short Film Festival in Boston, we programmed a clever short film that we enjoyed from Romanian director, Anca Miruna Lǎzǎrescu entitled Bucuresti-Berlin. Five years later, we not only programmed her short, Silent River, but it impressed us to the degree that we awarded it our top prize. 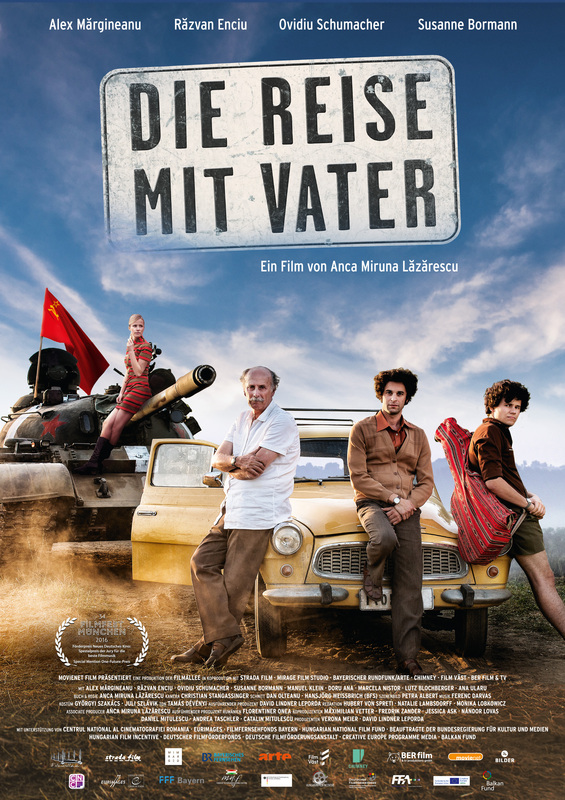 At SEEfest, our conversation centered on her wonderful feature debut, That Trip We Took With Dad, a sometimes absurd, comedic drama based on her own family’s experiences during a trip to Germany in August of 1968 that was disrupted by the Soviet invasion of Czechoslovakia. GF: Back in 2007, I was co-curating the European Short Film Festival at MIT in Boston, and we selected your film, Bucuresti-Berlin, which stars Ana Ularu as a young Romanian woman who immigrates to Berlin. Her story is told urgently, but ends lightheartedly. Five years later, we awarded our top prize to your short film, Silent River, which is a story of three desperate people who attempt to sneak over a border in the dead of night that is presented as pure drama. When you were originally writing the screenplay of your family’s story for That Trip We Took With Dad, which some describe as a comedic drama, did you feel compelled to balance the tone due to the differences between your previous short films about immigration? Do you feel that your family’s story that you depict in your debut feature has naturally comedic elements in it? AL: Yes, I would say that it definitely does. I grew up with this story, which I am sure that you have read about by this point. That Trip We Took With Dad is indeed based on my father’s story, and it was told to me so many times, usually at the Christmas table after presents were exchanged, so there was always this kind of nostalgia in the air, and whenever this tale was brought up, there was always a level of melancholy in the room that always presented the question, “What would have happened if we had decided differently and stayed in Germany?” I really did grow up with this story being an integral part of my life—in fact I cannot even remember the first time that I heard it. So, it was part of my family’s story, but it is also very common in Romania to tell such a tragic story with one happy eye and one sad eye, as people would say, so it is in my blood to tell such a tragic tale in a light and even an absurdist way so that in certain moments, one doesn’t know whether to laugh or to cry. Starting with the story itself, it is a family story, one where the family is given a present that they don’t even want to have in the first place. It is a burden to make a decision of such importance about your future when this choice is one that you never imagined having to make. So, when I start writing a script, I am always analyzing, which I know sounds very rational, but I would say that it comes more from my gut because I really rely on my intuition to guide me in crafting the exact tone so that scenes hit the emotions of the viewer in the way that I want. In the case of my short film, Silent River, it is a straightforward story about three people who are trying to survive, and the characters have their own existentialist dilemmas as they struggle to cross the Danube and have to trust each other in multiple capacities, making the film more of a drama than a tragic comedy, even though a lot of criticisms suggested that Silent River does have some light, more relaxed moments. But, That Trip We Took With Dad does not have that same existential dilemma attached to the main character, Mihai, whose responsibilities as a makeshift maternal figure to his father and brother drive his behavior and actions. In the end, it is a family story, and that family is chaotic and has a main character who is juggling the problems they face to try to keep the family together. The character of Mihai does have a plan on how to fix things, but this plan gets challenged because of his dad’s health and his crazy little brother, who Mihai must act as a mother to because their mother has died. And then, even his backup plan gets ruined by the Soviet invasion of Czechoslovakia, so they end up in the middle of a socialist commune in West Germany, and that is why for me there was no issue in balancing the tone because what actually transpired was already so absurd. GF: As I understand, the character of the younger brother, Emil, is your father in the story, but you center the film on Mihai, Emil’s older brother. Can you discuss your decision of making Mihai the center of your film? AL: I loved the story that my father gave me, and I loved this idea of being able to love and to hate and to be full of passion for your dreams and ideals, as I was the same way between the ages of sixteen and eighteen, but when I started writing this, I was already in my mid-twenties, and at that time I felt that Emil was a perfect antagonist, a perfect troublemaker, perfect to cause a disruption of all of someone’s plans. For me, I was already embedded in my life in my mid-twenties, so I was too far away from seeing life in a clear, black and white way as I did when I was a teenager and was well aware that when I was older that most issues had shades of grey in them. In my first version of the screenplay, I tried telling the story with the characters being a mother, father, and an eighteen year old. I completed the entire first draft, but when it was all done, the story was just not there, and by that I mean it was just not as complex as I had hoped for. This leads me to the day that I killed the mother character, which was one of the best days of my screenwriting process for this script because I really felt that a female role in that car traveling from Romania to Germany was not what I wanted. I realized that the interactions between three men who forgot what it was like to fall in love and to have passion would create the tension and conflicts I was interested in, so that is when the character of Mihai, who is based on a real person, rose up as the central figure of the story, as the character and the real person did have a huge influence on me, but in reality, my father did not have an older male sibling, so I think that the final decision to make Mihai central in the story was that the character reminded me of myself in that time, and Emil was my father when he was young. GF: As we are discussing the character of Mihai, I understand from a previous interview that you wrote a backstory about Mihai and Ana Ularu’s character, Dr. Sanda Berceanu, that was not intended for use in the final cut of the film, but only to serve as motivation for the character of Mihai? Was there ever a desire to add these scenes as to more clearly define Mihai’s feelings towards his brother’s relationship with Neli and Mihai’s overall disillusionment with his own reality? AL: Well, to tell you the truth, the director Anca is quite happy with the final cut of the film, but of course there are some details that I would like to shoot differently, but all in all, I am very happy with the film as it is now. Now, the scriptwriter Anca has a lot of questions like, “How can it be that such a huge, beautiful, long script had to be chopped?” and the answer is in fact quite simple. This romantic backstory that I wrote for Mihai that I thought, and many of my colleagues thought, was a very strong scene was one that we indeed shot and then had to delete, which you can see for yourself as part of the DVD extras when it is released on May 19th. I personally thought that it was a bit ridiculous to not give this handsome, young doctor a love story—I mean he cannot be a monk afterall! I had written this scene and was so glad that Ana Ularu came to casting and performed the scene, besides the fact that we are such good friends and have worked together before, her performance is wonderful, and I have issues with it not being in the film. Also, I felt for Mihai that there must be someone who ruined his possibility of a romantic relationship, for in the scene, she is pregnant and has a new husband, so I am somewhat bothered by the loss of this part of the film, but, in the end, the editors felt that it was an important cut as we agreed that being that the scene in question occurs early in the film, and that stylistically at least, given that the film is a road movie, we should not delay their travel scenes any further in the narrative. GF: You show Nicolae Ceaușescu’s August 1968 speech condemning the Soviet aggression in Czechoslovakia, but a year later we know that Ceaușescu would invite Richard Nixon to Romania, which led to many Romanians disillusionment with their leader. We also see a disillusionment with Dubček occur after the Soviet invasion. Does the betrayal felt by Mihai’s father foreshadow the way most loyal Socialists would soon feel in Eastern Europe? Do you feel that betrayal is the underlying theme of your film? AL: I thought about this a great deal when I was editing the screenplay. My main topic for this film is “How free are we to choose freedom?” because, my theory about freedom is the line that Janis Joplin sang, “Freedom’s just another word for nothin’ left to lose,” so it is easier to speak about freedom and make the decision to be free when you have family, or if you have a burden, or if you have such a system like where I grew up, and so, I thought about this question for Mihai: How free is Mihai actually to choose freedom, and is the freedom in the west really the freedom that he is looking for, or is it some kind of inferior freedom that he is allowed to reach? I think that at the end of the film, he is as free as he would ever be. As far as Ceaușescu’s speech in 1968 that you mention, I grew up with a father who blamed himself for all of his life for the decision that he made to go back to Romania. 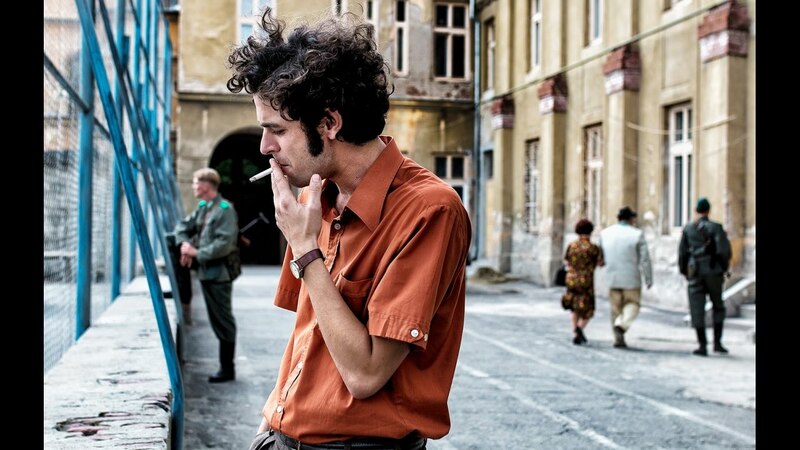 He took almost two years to realize that he made the wrong decision because when he came back home, he and his girlfriend Neli really did break up the way I show it in the film, and Ceaușescu did not become the Romanian version of Dubček that he so hoped that he would become. So, this speech and this particular moment that my father faced in the west had a huge influence on his life because, whenever he told me this story, tears filled his eyes. On the one hand, my father blamed himself for what he did, but on the other hand, he never felt the level of pride of being Romanian than the way that he felt during those days of being in West Germany during that time. Many people congratulated him on the street when they found out that he was Romanian. Even the German policemen, who picked them up on the road when they ran out of gas, congratulated them because of the speech that Ceaușescu gave, and my father, who always felt that he came from a country that was usually considered second class, suddenly he believed that he came from a place that could emerge as a strong voice in Europe, and maybe that this was indeed the right way to live your life, away from the capitalists who lived in West Germany. You have to understand that during this moment, Ceaușescu really believed that he was right, and, in fact, he was right in his condemnation of the Soviet aggression against Czechoslovakia, but as you know just a few weeks later Ceaușescu was called to Moscow, and after that, no one was allowed to even mention his speech in Romania. That is why I needed to add this speech into the film, and the result is that many people who have seen my film in the west, and even some back in Romania, discovered that they were unaware that this speech even took place. GF: I’m impressed you went as far as to create a band with a sound from the period called The Stormy Sundays. I know that budget may have played a role, but what was your impetus for doing this and not simply acquiring a song from a lesser-known band of the era? Being that this is a period film, was there a concern for using a song that may have been used in the past in another film that would have evoked different emotions and sentimentality that you wouldn’t have wanted? AL: When I was writing the film, Creedence Clearwater Revival was a huge influence on me; they inspired me so much. They were a good guiding point because, although their songs may sound uplifting, there is a depth to the lyrics, and here I am thinking of their song, “Bad Moon Rising.” The budget sadly wouldn’t allow for the use of their music, but we were so lucky to have found songwriter brothers from Nashville who recorded music that was perfect for the era. Also, with Mihai, I wanted something that truly belonged to him and whenever you start to imagine that Mihai would be a huge fan of Creedence, you would then immediately have an opinion on it, or as you say, it would draw up personal feelings and opinions. There is also the concern that people might start wondering if Creedence was even music that Mihai would have heard in Romania in 1968, so all of these factors played a role in acquiring music specially made for the film. GF: Thank you Anca for this interview and for your film. 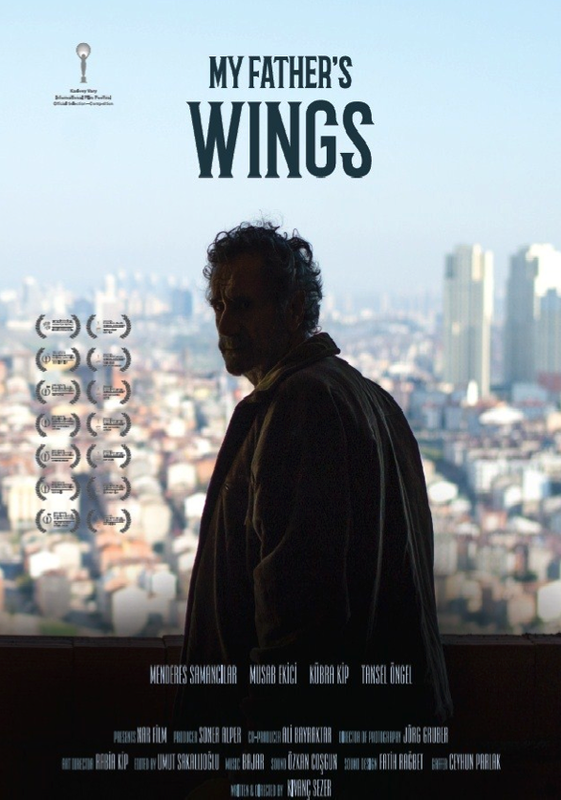 We saw over fourteen feature films at this year’s SEEFest (the South East European Film Festival) in Los Angeles, but the film that most impressed us was My Father’s Wings (Babamin Kanatlari), the debut feature from Turkish director Kivanç Sezer. Inspired by a workplace accident that claimed the life of a university student in the director’s native Turkey, Sezer’s film draws attention to the issue of poor worker safety that has become a crisis because of unregulated subcontracting practices in the high profit market of constructing new homes in high rise buildings that meet updated earthquake codes emerging after the destruction caused by the 1999 earthquake in Istanbul and the 2011 earthquake in Van, along with the ongoing concern of the impact of expected future earthquakes. We sat down with Kivanç Sezer to discuss his feature in depth, specifically focusing on how his education in bioengineering impacted his creative process, his character development, as well as choices in how he depicted the different cultures that exist in contemporary Istanbul in his film. : After the screening at SEEFest of your debut feature, you stated that your intention for creating it was to draw attention to Turkey’s dubious distinction of leading Europe in worker-related fatalities. We know that some of these issues are due to an increase in construction because of the Turkish earthquakes in 2011 causing a severe homelessness situation. Has this already dire situation been exacerbated by Erdoğan’s decision to prioritize the building of an overpriced presidential palace? Was his action to disregard the crisis further inspiration for your need to create this film? KS: The Van earthquake of 2011 actually did not affect the whole country. However, it had a very strong effect on the region and on our character, İbrahim, who is from there, but Istanbul was central to the script construction, and therefore it is the main setting for the film. Now, regarding the story, my main inspiration was a news article that I read in 2010 about a university student who was working on a construction site and was killed there. It deeply affected me, and this started my interest in the subject. After I began researching this incident, I began to realize that worker safety was a large problem that was not being covered by the news, and this situation is symptomatic of a system that does not give working class and poor people proper access to education, so they are forced to work these kind of jobs while attending school. The safety problems in many of these workplaces are well known, but the bosses are just concerned about their profits. When I started going to worksites to do research, it became apparent that the building industry is the driving force of the Turkish economy, but on the other side, the government does little to control the hazardous situations that many workers face every day. The government is just focused on the wealth that this industry brings in and little else, as there is high demand for the apartments that are being built, a demand that is not only coming from within Turkey, but also from Arab nations as well. Investors pump money into these projects and hire contractors who demand quick results. So, my main concern was to address this hyper-profit driven model and the resulting human stories within this growing but broken industry. As for Erdoğan’s palace, that is something else. It is a high profile example of the issue, but the safety problems going on all over Turkey are more dramatic. I am deeply concerned about these workers’ safety and wanted to make a film centered on them. LF: Based on your film’s subject of building construction and your personal interest in workers’ stories, we would like to get a better understanding of your shift from engineering over into filmmaking. One of the things that I found interesting about your film is the way you put it in the context of fears of future earthquakes. In one scene, we see a couple interested in buying an apartment in this building because they want a space that is more structurally sound. Was part of your interest in human stories partially derived from your own decision to depart from engineering and to become a filmmaker? And, did your understanding of engineering lead you to focus in on this specific situation of construction dangers for the subject of your debut film? I ask this because, when you are a scientist or an engineer, scenarios happen a lot in the field where you create some sort of solution on paper, but you might not completely think of the impact of that solution on the people who have to build it. KS: Let me add one additional point regarding the earthquake. Before the 2011 earthquake in Van, a very strong earthquake happened very close to Istanbul in 1999, and thousands of people died in the Marmara region. So after this incident, all construction regulations changed and adapted to prepare for an earthquake in Istanbul that the experts predict will occur in upcoming years and will cause thousands of death when it arrives. Coming to my education, yes, I do believe that my background in engineering had some influence on me in terms of this project, but my background is in bioengineering, so my work was mostly done in the laboratory. When I was studying, I appreciated the notion of optimization in engineering, and that, I do believe, affected me when I was creating my characters. In a way, I optimized my characters for the story. The story itself has a context and a backdrop, which in this case is construction, but it also has an internal aspect in it as well as drama, which both come from my heart and not my mind. My engineering background will always influence my mind in some way, but I am trying to find the stories that touch my heart, and then through my heart, I go to screenings to see audiences and hope that it reaches them in the same way. I put this husband and wife in the film because they are like many people who are looking for a place to live and who are afraid of the upcoming Istanbul earthquake, which they are sure will happen, and so they want to buy a new house which will be constructed properly. You see a predominance of the buildings that were constructed before the earthquake that were not built properly and were consequently damaged, and that is why this couple wants a flat in this new building. This couple is important to me as they are buyers, and they are the ones who will be paying for this apartment for ten or twenty years with a huge mortgage, so they are the ones who keep this system intact, and that is why they are going to be the focus of my second film of this trilogy. In the third film in the trilogy, I would like to then focus on the lives of the big bosses who make this building happen with all of the corruption and money that is involved. So, the connection will be from the earthquake to the construction and from the lower, middle, and upper class people involved. GF: Hearing now about your plans to create a trilogy centered around this building, I cannot help but to be reminded of Krzysztof Kieślowski’s Decalogue, which you know adapts the biblical Ten Commandments in a modern context by playing out each one through the lives of the residents within one housing complex. Was this series an inspiration to you at all? KS: Actually, Kieślowski’s Three Colours trilogy was my inspiration for these films in terms of overlapping stories in three different films. For instance, you see a character from White in Blue as an extra in the background, and then in White, that character you saw in Blue is now the focus, and that is what I want to do in my trilogy. That is why I show the couple who is looking to buy an apartment in My Father’s Wings, for they will be the subject of the second film, and in the second film you will see a glimpse of the big bosses who will then be at the center of the third film. There will be a lot of interactions between them, all of which I feel connects them, which is important, for in life, we are not usually aware of these connections. You are usually not aware of who built your house, or if someone died while they were building it, and it is that kind of alienation that keeps us going, and I think that cinema can break this kind of alienation and obliviousness that we have. GF: An aspect of your film that we also found interesting was the depiction of faith between the character of Master İbrahim and Yusuf. İbrahim is an older family man, who is seen praying at the mosque, whereas Yusuf uses colloquialisms attached to faith, almost with a level of disdain, and seems to be more of a secular being. Can you discuss your intentions with the faith depiction within these two men? Is this simply a comment on these two different generations? KS: Faith is an important element in the film, and for İbrahim, his is a pure religious faith. He goes to the mosque to pray, but he also gambles as part of his character. The bad things that he has done in the past are also part of him, but then he decides to quit doing bad things, but his dilemma still remains: his faith is not enough to make his life better, which drives him to the edge where he must confront his reality of needing money. This leads İbrahim to the decision to commit suicide so that he can receive compensation money from the company that hired him which he can leave to his family, and this, of course, is a sin. Yusuf on the other hand, has little religious faith and only believes in himself and his future, a future that he believes will bring him success as he will rise through the ranks and no longer be a worker, but perhaps a contractor himself with his own company someday. In a way, their perspectives on life connect these two characters, because, to me, they are the different sides of the same coin. They both are looking in different directions, but at the same goal and with the same level of self-sacrifice. I should also say that without the character of Yusuf, the film would be too grim, giving little hope to the audience to sustain them throughout. Yusuf is also important in adding a level of humor and a look into the younger generation in Turkey that hopes for a positive future. One critic remarked that Yusuf is actually the central character of the film, and not İbrahim, which I am fine with as I am aware that they are very close to one another, so to designate one or the other as a supporting actor was not that important. Establishing the unity between this uncle and nephew was more important to me. LF: In terms of their unity, İbrahim and Yusuf are different when it comes to faith, but can you speak of the halay (dance traditions) that connect them and many of the characters to the region they are from? KS: İbrahim and Yusuf are Kurdish, and the Kurdish people express a good amount of their feelings through the halay. In demonstration, people dance the halay; at a wedding, of course, they dance the halay, and even while they mourn, they dance the halay. It is very common, and during my preparation for the film, I watched a lot of videos of workers dancing at construction sites. To me, it is a sign of life because in the construction site — where it is so cold, where it is so grey — they need something to carry on, and for these characters, dancing the halay is the will for life. GF: Understanding the importance of dance in the Kurdish culture increases the impact of the scene when Yusuf, after speaking to his friend about wanting to become a boss, breaks up the dance that the Kurdish workers are teaching the Uzbeks at the construction site. It says a great deal about what sacrifices he is willing to make in order to succeed. LF: And, to that point, I love that you show the halay and its role in multiple moments throughout the film. One of my favorite scenes in My Father’s Wings is when you see Yusuf and his girlfriend dancing with a group of young people in the town square. Yusuf’s girlfriend, Nihal, is wearing a hijab, but you also see a mix of women who aren’t wearing a hijab and are dressed more in a western style. KS: And that is what we have in Turkey. I think that many people who have never been there think that we all are still wearing fez hats like we did during the Ottoman Empire and that everyone wears a burqa or a hijab that covers everything but the eyes. In contemporary Turkey, the hijab is a common source of debate because, for many years, the secular people asserted that in schools and in public places the hijab should not be allowed. It has even sometimes been so much of an issue that students who wear hijabs have left the university. After Erdoğan came to power, the opposite began to occur, and now you see more women wearing hijabs in public. I have no problem with this either way, but this issue has two sides…The secular people sometime criticize me for depicting a woman wearing a hijab, and then the conservatives say that they like how I use the character because I show her fairly in that I don’t insult her or judge her in any way. The critics in Turkey liked the way that I framed the character of Nihal (Kubra Kip). It was her first film, and she does not wear a hijab in her personal life, but a lot of people thought that she wore it naturally. One conservative even joked and told her that she looked so natural in it that she should consider wearing it all of the time (laughs). She actually won three awards at three big festivals in Turkey for her performance. GF: I am glad to hear that as she is wonderful with her character. One aspect of Nihal that I find interesting as well is that as she is a more conservative person, I would imagine that it would be difficult for her to date someone like Yusuf because of the more secular way that he chooses to live his life, but she never tries to proselytize him in any way. I think that for western audiences it is important to see a character like Nihal who is so open minded. KS: It indeed was very important for me as well, and even though her character is only onscreen for fourteen minutes, she adds so much to the film. She is so open about how she feels that she, in turn, opens up Yusuf’s character. LF: Lastly, beyond the building, we get some glimpses of the surrounding architecture, but for most of the film, the setting is extremely sparse. Is the focus on the building of this faceless development indicative of a movement to create new buildings with complete disregard for any history of the city of Istanbul or Turkey overall? KS: I should say that the reason that I selected this particular place to shoot the film is because, when most international audiences see Istanbul, you usually see it depicted with a lot of older architecture, and we of course do have that, but in reality most of the population lives in the suburbs, and most of the buildings there are really designed in an inhuman way. I mean, how can people live normally on the fourteenth floor of a building, not being able to see any trees or having to look down to see people the size of ants? 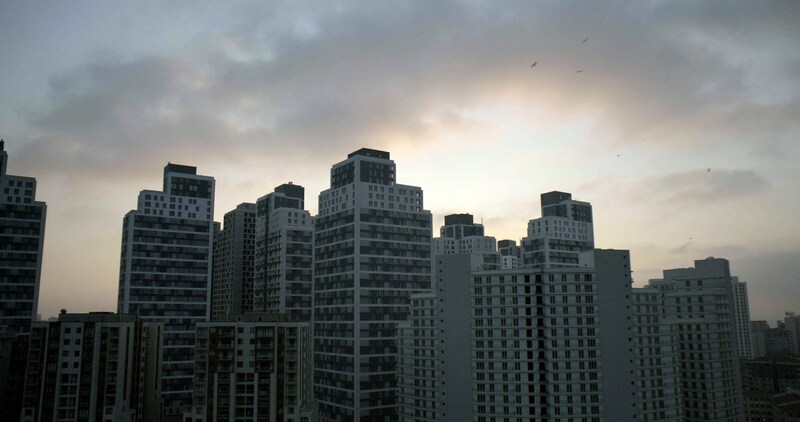 There are hundreds of blocks near Istanbul with buildings like the ones I show in my film. These buildings are also so very expensive, and given that so many people live so far from the city center, there are traffic jams everyday just to get to work. I wanted to show this side of Istanbul that you rarely see, and even though this district has its own culture, overall, it was not my goal to make a tourism video to sell Istanbul to the audience. GF and LF: Thank you Kivanç for your time and for your film. As part of his recent week-long visit to Los Angeles sponsored by the Los Angeles Filmforum, Film at REDCAT, and CalArts Film/Video, during which he taught classes and screened his globally acclaimed features at The Cinefamily and the Aero Theatre, director Apichatpong Weerasethakul visited the Billy Wilder Theater at the UCLA Film and Television Archive to take part in a two-night complete retrospective of his rarely screened short films. 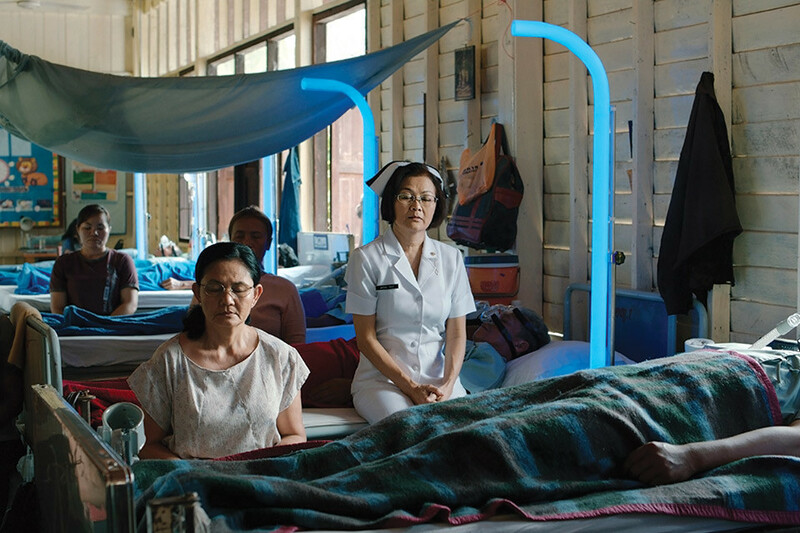 These appearances by Weerasethakul had long been circled on our calendars (and those of many others who attended the sold-out screenings) as we have joyously followed his career since seeing his exceptional 2004 Cannes Jury Prize winning film, Tropical Malady. We were thrilled to have an opportunity to sit down with Weerasethakul for a short interview that turned into a fascinating and sometimes bizarre ninety minute discussion about everything from his filmography to the beauty and ugliness of Buddhism to censorship issues in pre- and post-military coup Thailand to the failure of media to represent innovations in science. Weerasethakul has exceptional sensibilities in capturing the many layers of reality around him, and for that reason his films and his conversations with us and the audiences who attended any of his screenings are engaging, giving, and outstandingly thought-provoking. Lily Fierro (LF): One of the things I’ve loved about your films is that they are films of contrast. And this is especially true for Uncle Boonmee Who Can Recall His Past Lives and Syndromes and a Century, where you have very different characters, time periods, ghosts, and problems in and outside of the city. Could you speak about how you get inspired by the city and the places outside of it and how the two can exist in the same space even though they are so different? Apichatpong Weerasethakul (AW): I grew up in a small town that now is big, so I’ve seen really rapid change all over Thailand and also Asia over the past 30 to 40 years. Also, these contrasts are even clearer because there’s this feeling in Thailand that everything is always part of a very centralized culture that revolves around Bangkok. So, I have had this feeling that I don’t like the city of Bangkok, and that lasted until now. When I started in movies, I tried to avoid Bangkok, and I just traveled around. And then with my next film, Tropical Malady, I was in the jungle in a small town, and with that, I was really interested in the contrast because even though the movie is staying in place, the emotion is shifting from the beginning, which starts very pleasantly, to the end, where even the same environment, the same sounds of birds become very oppressive, very heavy So, I think it kind of shifts, and also when shooting in the jungle, you see the shadow and the sun, and when you are waiting for something or when you are preparing during the day and night, you see different characters of nature, so that’s why I decided to make Tropical Malady about this difference between darkness and light, present and past. LF: As a practicing Buddhist, I must say that you perfectly capture the conflicts and difficulties with living with the belief system in society, past or present. Here, in the West, it is rare to see the complexities of Buddhism on the big screen, and your films always have a Buddhist influence. For example, many of your films mention the merit system at one point or another, especially when a monk appears. Could you talk about how you look at Buddhism and how you integrate your perspective and thoughts on it into your films? AW: In fact, I’m quite fascinated by the karmic law that we believe. And, it’s so hard to shake it off, especially when you were young and raised with those ideas, and I just feel that it’s a curse. I really feel that karmic law is so, in this century in a third world country, prone to abuse politically, and so people become quite passive. For example, they would say, “This is our faith. This guy gained good merit before, so he deserves to be that and that.” It creates a strong hierarchy system in Thailand, so that and also the awakening of the country’s narrative through different media and the internet over the years makes you start to feel that there was a lot of propaganda around when you were growing up. The identity of the country is kind of shaking, so with the history, politics, and religion, it placed Thailand onto a very dangerous path now, I think. For me, we have so many rituals dealing with Buddhism from Hindu influence, and I think that is a big problem, to install something so physical into these beliefs, and so over the years, I was less and less interested in the ritual and more into what to present from karmic law. It is so fascinating; it’s just so beautiful and ugly at the same time, this manifestation of the merit system. I’m also quite interested in the meditation parts and how Buddhist philosophy is so scientific. LF: Yes, there are the cosmic planes! I really appreciate your description of the implementation of the merit system as “beautiful and ugly” because as someone born into the faith system in America, I always saw this in the temples here, and it is something I always struggled with, and it is why your films mean so much to me because they capture this paradox between the faith and the way it is practiced. AW: It shows in daily life, and so for me when I make film, sometimes I add just a little jab, or sometimes I am just inspired by these actions of myself and people. LF: Was this conflict of Buddhism in daily life something you noticed and had a discourse on before you went to America, or did you notice it more after your time at the School of the Art Institute of Chicago? AW: After. After. Before, when I studied architecture in Thailand, let’s say, I still believed in reincarnation. Even the first few years after going back home, I still believed, but now, I don’t. I just feel that it’s such a waste of time, and also it doesn’t really make people see the beauty of life actually, of just living. Instead of opening their eyes, they always think about the future; they always think about just going to the temple. Physically, you know, it is beautiful; it is exotic, but in fact, there’s a trap, and I feel that is the wrong path of Buddhism in Thailand. LF: It makes sense that Buddhism has led to passiveness because you’re always thinking about the next life, and you think to yourself, “I’ll get to that in the next life,” so you don’t do it in this one. Do you think this passiveness of people caused by Buddhism integrated into society is going to change after King Adulyadej’s passing? AW: No, I think it might get worse because the King’s passing is prone to manipulation by the current government. The situation is already showing on the street. How this situation has been used to make people feel together is a good thing, of course, but at the same time, it can justify certain evil from the government. I never approved of the army government that used weapons to create fear in people and silence critics, so with this collective mourning time, people are really fragile, so they can follow things so easily, so I am very worried about that. LF: Now that I think about it, you always include military figures or monks in all of your films. Is that because you see the military and monks regularly when you live in a town, or is it that they are supposed to be symbolic representations of forces at play in Thai society? AW: Oh, did I? Not really for the monks. For the military, yes. But for monks, I did not consciously put them in because you can see them so easily in the street. For military, yes, it’s the role I’ve seen them take over the years to be more and more repressive figures. Generoso Fierro (GF): During the Q&A session from last night here at UCLA, you said that Syndromes and a Century was censored by the Thai government. I can see the issue that the post-military coup government might have with Cemetery of Splendor, but it’s unclear to me as to what issue the previous government had with Syndromes and a Century. AW: It was not really a military time–we had a normal government then. They objected to moral issues because Thailand is super conservative, even though we have so many vices, but they just think of film as something that does not represent reality; it should serve some purpose. That’s why films in Thailand have a lot of fantasy, ghosts, or martial arts. With a film that is reflecting life and being done in such a natural way, they were alarmed about things like the doctors drinking, or the monk playing guitar, or the monk playing with the UFO toy, even though in real life, you see a lot worse. So, they really asked me to cut these moments out. At the time, the police department was taking care of film censorship, and they invited different people from different organizations that were linked to the film’s content, meaning that they invited people from a doctor’s association, a Buddhist group, and a journalist association along with a film scholar too to meet with a policeman around this round table, and I wasn’t allowed to enter the discussion until later when they decided, “We have #1, this scene, this scene.” And then, each one started to say, “Why don’t you make a film that shows doctors helping patients in surgery? Why don’t you make a film that shows the monks being good?” It was a really backwards way of thinking of film as propaganda that has to serve certain things. That was 2007; it was not 100 years ago, and the scary thing is that many people have this mentality until now, a majority of people, more than half, I’m sure. I was really angry, of course, and the film teacher from the university said, “Hey Apichatpong, you should stop making film. You should go back to school and learn how to make movies again.” That was really hurtful, but anyway, I just got out of that session, and I started the campaign for the Free Thai Cinema movement. We had protests, and we went to Parliament to try to change this law; it was an archaic law that had been around for a long time. And then, the censorship role shifted from the police to the ministry of culture, and so they have a rating system now, better but still a little backwards, but better than before. GF: With Tropical Malady and any other time when you address homosexuality in your films, have the censors drawn issues with that? AW: Not really. Now, somehow, homosexuality has been in the media for quite a long time. We have a very popular series about this teenager’s love, and it really is accepted. Thailand is one of those very odd countries in terms of human rights; there are many problems, but at the same time, people are very accepting of gay issues. It’s really common to see two men or two women holding hands. When you go to a 7-11, sometimes the people behind the counter are transvestites; this is really common. Transexuals also are often flight attendants. Sexuality is quite fluid in Thailand. I live with my boyfriend in a small village in a remote area, and people are very friendly and so accepting. LF: We’re glad to hear that. Southeast Asia is still so conservative politically and socially, so it is fascinating that somehow, Thailand is at least somewhat progressive on issues surrounding sexuality. AW: Thailand is still really xenophobic, but gay issues are okay somehow. GF: While Uncle Boonmee Who Can Recall His Past Lives has been often described as dream-like, I always thought of it more as an experiment of imagination because I’ve always wondered what forms people will take once they have passed away. How did you determine what form each of Boonmee’s visitors would take? AW: Oh, the forms came up from my memories of media because Boonmee is a tribute to things that I love: old television, old royal costume drama, old horror movies. Actually, Boonmee has six reels; it’s the film that I knew would be my last film shot on celluloid, and it was, so I divided it into the film system because when you show the film, each 35mm can holds about 20 minutes max, so for me, the film has six reels, and each reel has a different representation. The audience might not notice because it creates one storyline, but if you look at each reel, there is some different shift in color, different shift in lighting, and even the acting style, which sometimes is really realistic or sometimes really stiff like old TV. And one reel is a royal costume drama, the one with the princess. And the jungle in the last reel is my old adventure tales memory. Compared to the jungle in Tropical Malady, which is almost like a realistic jungle, the jungle for Uncle Boonmee is a jungle of media, so it has this day for night shooting, so there’s a really artificial blue tint for the jungle. This is why I introduce this film as a collection of memories. GF: In many of your conversations during your screenings this past week, you have mentioned your love for old science fiction. You have spoken of making a film called Utopia, which you originally said had a setting of the Starship Enterprise and would include notable science fiction film leading ladies like Jane Fonda from Barbarella. We have been hoping to hear word of you filming this. We love old science fiction, and this premise is too alluring. Is there any chance it will ever happen? AW: I think it’s very hard because I think I need to rewrite a lot of that. Because for me when I do projects, it is always about, like Mekong Hotel, which is showing now, revisiting old ideas but then changing it because it represents myself; not me, I mean, I’m not the person in the past called “Apichatpong,” and now, everything feels really distanced very quickly for me, so Utopia needs to be rewritten, but of course, if someone gives me the money, of course I would love to do it. It’s quite universal, and it’s really relevant now actually. I don’t know why I wrote that originally, but Utopia is all about violence in nature. The whole film is about the collapsing of the landscape in North America. Not in the city, but in the snow mountains and in all of these places. It’s almost like a very violent nature. GF: Your regular cinematographer, Sayombhu Mukdeeprom, was stolen from you by Miguel Gomes for Arabian Nights, leading to him spending more time in Portugal than expected, which prevented him from being able to film Cemetery of Splendor. When you and Sayombhu work together, how much do you influence each other’s vision because you can definitely see elements of your style in Arabian Nights and Cemetery of Splendor has a different look in its use of artificial lighting and color? A: AW: Yes, Sayombhu was stolen. With Sayombhu, it went back to Blissfully Yours. That was his first feature film, and he used to only work in advertising, but he really understands me; he’s one of the very few DPs who understands what’s the difference between advertising and cinema in terms of image, and he also studied at a Russian film school under the DP of Tarkovsky, so he has quite an eye and a philosophy of cinema, so we got along very well from the first film. And so he influenced me a lot, and also, he knows me and my preferences. It is the same with my editor and sound designer. GF: You develop that personal relationship. We saw Leos Carax speak about his cinematographer who recently passed away. Though the two weren’t great friends, they ate breakfast together nearly everyday, and that’s not something you can easily replace. I can imagine that it was strange when Sayombhu was stolen. Did you get a chance to see Arabian Nights yet? AW: Unfortunately no. It was at Cannes, and I was just too busy. GF: It is a magnificent film. If it is a consolation, you lost Sayombhu, but he did phenomenal work on Arabian Nights. LF: Cemetery of Splendor was filmed by Diego García who came recommended from Carlos Reygadas, a director whose sensibilities are not too far from yours. You have said that Cemetery of Splendor is most likely your last film shot in Thailand, and in last night’s Q&A, you mentioned that Latin America may be your next destination. Did working with García and/or speaking with Reygadas point you even closer to Latin America? AW: Exactly. Not only Carlos, but also just being there in Mexico City because I have a gallery there that I work with for visual art, so I went there quite a number of times, and I think my draw to Mexico is because it is actually the reflection of Thailand because it’s so comparable. Something like Tropical Malady or other Thai myths and jungle stories that I liked were written in the ’60s and ’70s, and they were actually influenced by the American or European writers that went to South America to create stories about these adventures and animals during colonial times, and they wrote, really, about a romanticized jungle. So actually, for me, there’s a trace of this influence to make me interested in the allure of the jungle, so I think maybe going to South America is like going back to the source to this thing. I was in Peru, and it was like going home somehow. I don’t know why. To see the ruins and the technology of the past is almost like science fiction to me but reversed in time. GF: When you see a Mayan temple, it really does feel as though you are entering a science fiction film. South America has become so fruitful in its cinema too–the new movements in Chilean and Argentinian cinema are just two of the scenes that are thriving, so it would be a wonderful place for you. LF: Science is clearly something you love; it always has a visual influence in your films, and it also has a thematic role too. In Syndromes and a Century, science has a very interesting role in the way that it impacts our daily relationships. How much of your interpretation of science, its applications to the past and present and how it can make people more separated from each other even though it can help make life better, goes into your films? AW: For me, science is like art. For me, they are very inter-woven. In Cemetery of Splendor, it is really about perception, and how our brain works and how loneliness can trigger something, and how dreams can manifest desire and imagination. I don’t know; it’s hard to explain, but it’s all these inner-workings when we sleep or when we dream that I am interested in, and I did quite a lot of research and tried to present it in the film–how some logic seems to be in our dreams, how some logic seems to be okay even though it seems so outlandish sometimes. So, this representation of dream is very interesting to me. It’s not like when you dream in let’s say mainstream cinema, sometimes you can see something like a Salvador Dalí painting, things melting or something like that, but for me dreams are really so ordinary, but there is some little chip of logic in them. LF: And, that’s why you have the different colors of light in the hospital, right? I read that you had been interested in how colors can modulate brain activity? AW: Yeah, there is really amazing research about how colors can trigger false memories in mice; it can introduce information there. I think maybe we already do that with film. When you look at cinema or media it’s already there, you know, you just put information in people. For me, the sleeping soldiers and all this shifting light maybe are about just putting all this narrative into their dreams. It’s like education; it’s like how we grow up: what we are told and how we are being lied to about different pasts. GF: You had mentioned in a Q&A after the first night of short films that you were a big fan of Gattaca, so much so that it was part of one of the listening exercises that you conducted with students at CalArts this week to get them to be more aware of sound. Gattaca was so underappreciated here because I think that when most Americans think of science fiction, they think of Star Wars and that type of science fiction film. Gattaca is a very intelligently made film; I wish Hollywood would look at science fiction less as action cinema and more as an opportunity to operate a narrative in a genre that is so expansive; you can do so much with science fiction, but for the most part, it always turns into Guardians of the Galaxy. And, it doesn’t have to be that. LF: And science in and of itself, has smaller things happening than space travel that are fascinating, and you can explore them in film. For example, we’ve seen research where microelectrodes can be implanted into a mouse’s brain, and a radio can be used to control their movements. There’s also active research about the neural encoding activity of birds as they learn how to form their own birdsongs. There are a lot of strange and amazing things happening in science that would be great platforms for science fiction, but I don’t think they will get used. AW: I love Gattaca. This country is so big that the progress of science is so fascinating, the research. But at the same time, it is not reflected in the media, in popular media, so it seems like it is not really well synchronized. It should, no? Media should reflect the humanity of these times, so scientific progress should be in the media. GF: Thank you so much for taking the time to speak with us. This conversation reminds me of the one that I was very fortunate to have when I had the opportunity to interview Abbas Kiarostami many years ago in Boston before it became impossible for him to get a visa to visit the United States. A great deal of our conversation that day involved his issues in creating cinema during the Iranian Revolution and the continued censorship he had to deal with as a filmmaker. Understanding your current issues with censorship, we so appreciate your open candor in regards to not only your work but also your comments about the current state of Thailand. We would like to give special thanks as well to Los Angeles Filmforum, CalArts Film/Video, and Film at REDCAT for bringing Apichatpong Weerasethakul for an expansive retrospective. 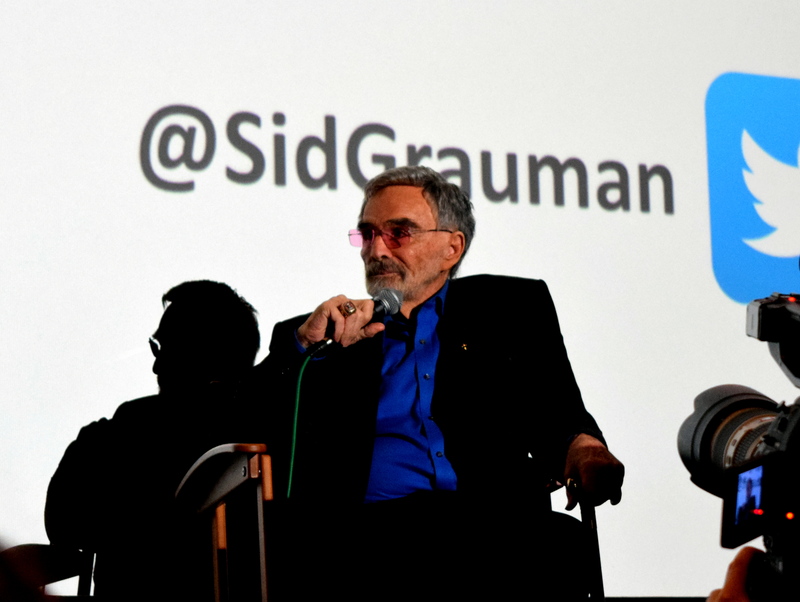 We would also like to give additional thanks to Kelly Anne Graml of the UCLA Film & Television Archive for making this conversation possible.